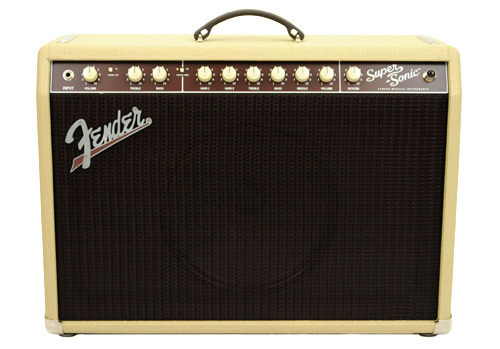 Super-Sonic 22 Combo, Tube Combo Guitar Amp from Fender in the Super-Sonic series. 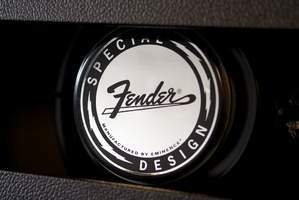 Fender amps are known and recognized for their clean sounds, sometimes bright with models like the Vibrolux, sometimes warm and full with other references, like the famous Bassman. 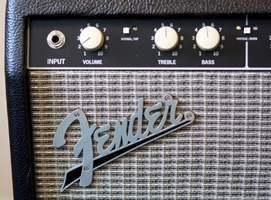 But for heavily distorted sounds, the story is different, and guitarists are often forced to resort to overdrive or distortion pedals in order to saturate an amplifier lacking a real overdrive channel. So we could have just stopped there and continued to adore the clean Fender amp sounds and happily connect our pedals to make some noise. But Fender wished otherwise, launching the Super-Sonic series, whose main goal is to offer both clean sounds worthy of their greatest signature amps, and overdriven sounds, very overdriven tones to please biggest fans of sturdier sounds. The combo is made of birch/maple plywood 1.9 cm thick and has the following measurements: 21.6 x 61 x 44.1 cm and measures 18.2 kg on the scale, which is quite reasonable without making a traveler’s amp out of it! 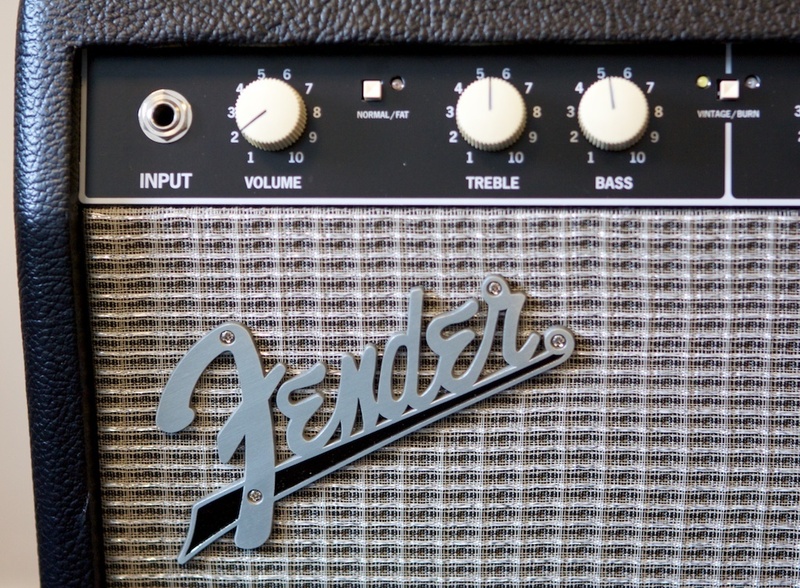 The look of the amp is very classic, with the old school script metal logo, the ivory ‘radio’ knobs and the large red LED on switch. The grille cloth covering is black vinyl on the blond version, and gray on the black versions. 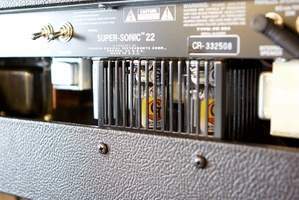 The "Dog Bone" handle on the top of the amp is plastic, but looks very solid, and metal reinforcements are placed at the bottom four corners of the amp cabinet. Everything looks good to handle things down the road and finish is impeccable. 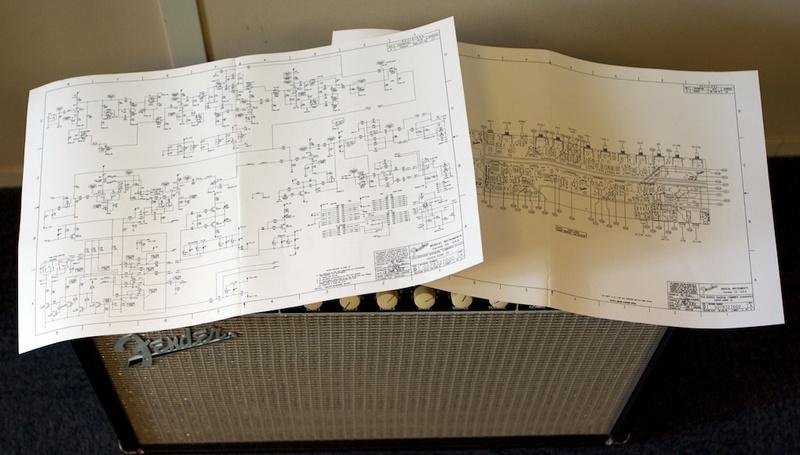 In the box we are provided in addition to instructions, diagrams showing the guts of the amp. The latter, for sure will be the conversation topic at your next dinner party….guaranteed! The icing on the cake: a nylon cover is provided to protect your precious from dust- classy! 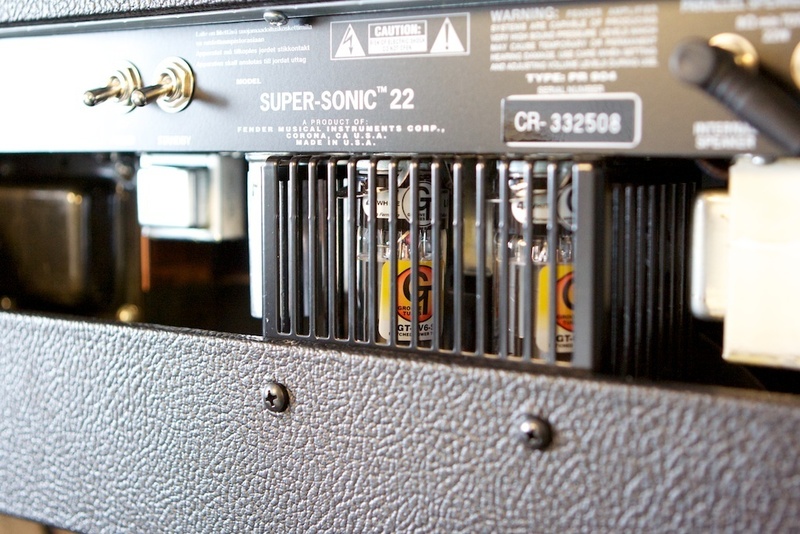 Under the hood, we find no fewer than five lamps for preamp section: three 12AX7 and two 12AT7, and two 6V6 power tubes for the amplification (modeled on the Deluxe Reverb). The lamps are protected by a gate at the back of the amp, just above the 12 inches (31 cm) speaker, a "Lightning Bolt" model by Eminence. We'll start with the connections, with the front, the classic guitar input jack 6.35 mm, for the others we must return the amp. On the back is the base for the outlets, the switches and power stand-by and two speaker outputs. The latter, a plug for the internal speakers and one for external, are in parallel, and the total impedance must be at least 8 ohms. 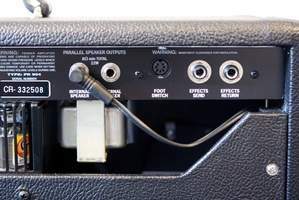 It is important to note that you will always have a speaker connected into the "internal speaker", thus you will not use the other plug if you want to connect both speakers simultaneously. We also find the jack for the footswitch, it is of high quality and impeccable construction: metal, heavy, and offering no fewer than four switches: one for changing channels, a boost for the clean channel, one to activate the reverb, and one for the effects loop. Regarding the latter, both plugs used to send and return signal are placed at the far right rear panel. The front panel includes all the settings that will shape the sound of the amp to your liking. On the left side, we find the setting corresponding to the first channel called “vintage”. 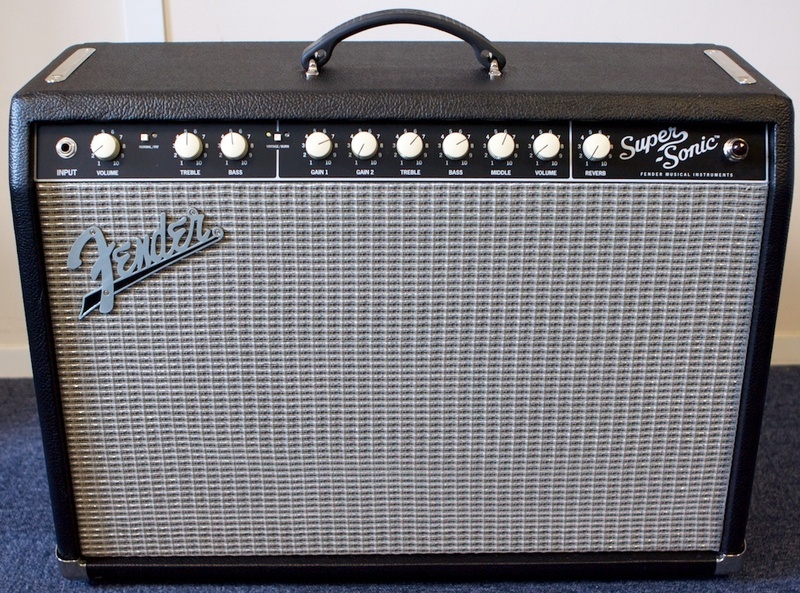 It has a small square switch to toggle between "normal", with clean sound based on the Deluxe Reverb , to a "fat" mode, which boosts the mids and delivers more easily a more powerful crunch sound. We found only three settings: a volume, which when pushed will crunch the signal, and a simple two-band equalizer: bass and treble. It is not much, but perhaps sufficient given the presence of the normal/fat voice switch. The "burn" channel has a little more knobs to start with- two gains, a 1 gain and a gain ... 2! 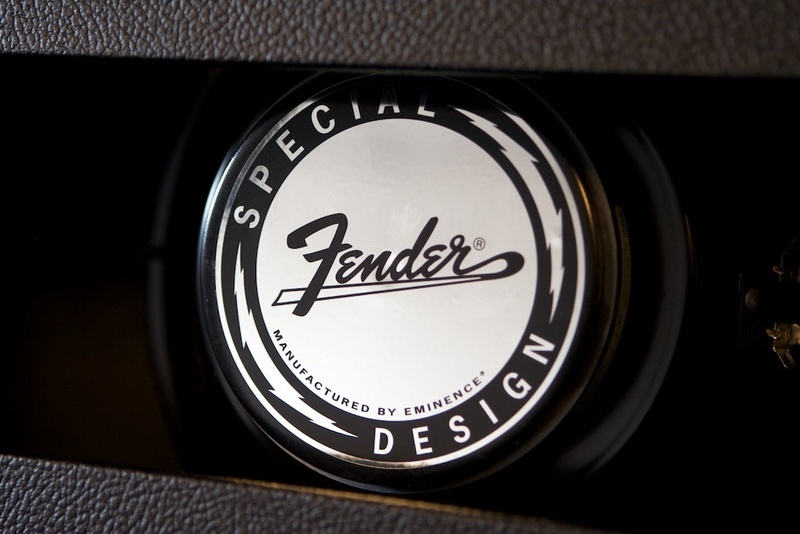 The first gain allows you to go from a crunch sound to a much more saturated sound, while the second gain will add compression and body to fatten the sound a little. On the EQ side, this time we find three bands (low, medium, sharp), and a volume controlling the overall level of the "burn" channel. Finally, you will find the reverb adjustment knob that is a long spring model designed by Accutronics. Now, the only thing left to do is to heat up the beast and let’s them talk decibels! To test the amplifier, we used a Fender Telecaster Deluxe equipped with P-Rails pickups from Seymour Duncan, a Gretsch G5139 mounted with TV Jones Magna'Tron pickups and finally a Gibson Les Paul Studio. We crafted our sounds with our Two Notes Torpedo VB-101. We start with the vintage channel and the "normal" mode. With the Gretch neck pickup setting or the Telecaster set to ‘rail’ position, the sound is very balanced, with nice bass, treble and body glitter. It's simple, it lacks nothing, it was a typical Fender sound to our delight! By plugging in the Telecaster that has, with its P-rails in position P90, a higher level of output, we realize that "normal" mode can easily crunch. The sound is good, even if one could complain about a slight excess of high frequencies. The sound stays natural and the twang of the guitar is well illustrated. By switching the switch to "fat", we go straight into overdrive, and it still sounds great! The first channel does not limit the clean sounds, and proposes crunch sounds limited to the overdrive following the guitars. The second channel, "burn", will drive up the gain in two, three movements. With the TLC-position double humbucker, gain 1-6 and gain 2-0, we get a sound leaning toward fuzz and this is it quite interesting. We appreciate the two gain knobs that can independently adjust the saturation and signal compression. This has the advantage of offering a fairly wide and diverse sound range. Obviously, we also took out our Les Paul for the occasion to test everything, and the results were conclusive: one can do rock, and can do heavy stoner with a Fender amp! Metal heads, however, will have to part ways, or try to place one of their favorite pedals in front of the Super-Sonic. With the Les Paul Burn on the Burn channel, pushing the first gain and leaving the second in the starting blocks, we obtain a good saturation appropriate to rock and blues depending on the position of the volume knob. By pushing the second gain, the sound thickens and we can attack a heavier register with no problems. Having a big saturated sound on a Fender and without a pedal? Yes, you can! We have nothing bad to say about the integrated Accutronics reverb springs, which does perfectly its job and gives old school touches that we love so much. 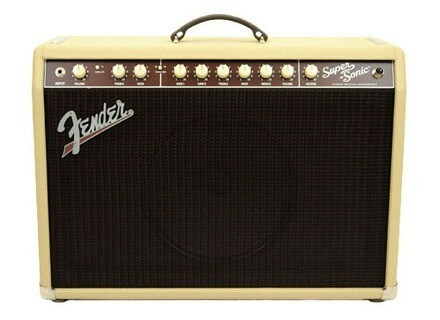 For about $1400, Fender offers us a 22 Watts all tube amp of flawless quality. The look is very successful and it has ample power to play quietly in groups. 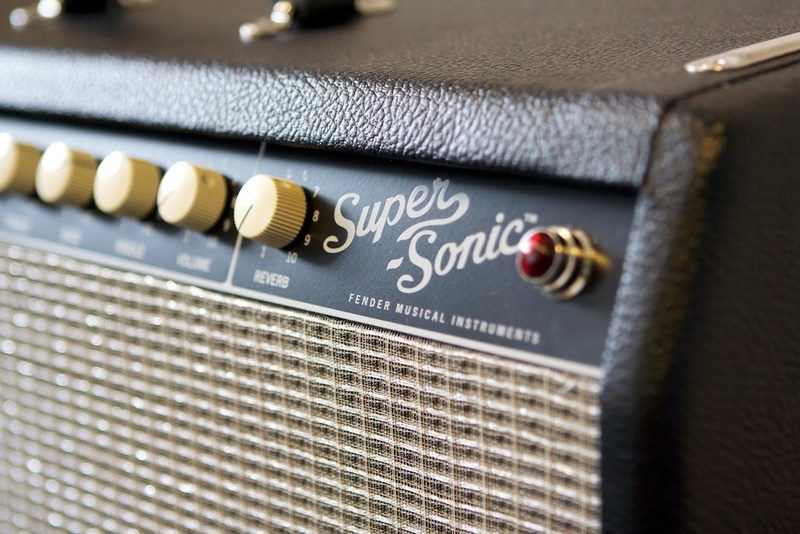 The clean sounds are typically Fender for our delight, the crunch sounds are not standing still, and we have a real distorted channel, to top it all off. Add to that an effects loop, Fender long-spring Reverb by Accutronics®, robust and complete pedals and a protective cover, and you get a receiver complete and flawless. We only lament the price and weight, both a bit high for a 22 Watts. But when you get this sound, we are ready to make such concessions!